A copper alloy Medieval object, possibly a book fitting dating from AD 1200 - 1500. The object is a rectangular plate, almost square, which has a large and worn loop, in the same plane as the plate, projecting from one end. At the other end, two lugs project, one at each side, perforated to support an axis bar which is now missing. 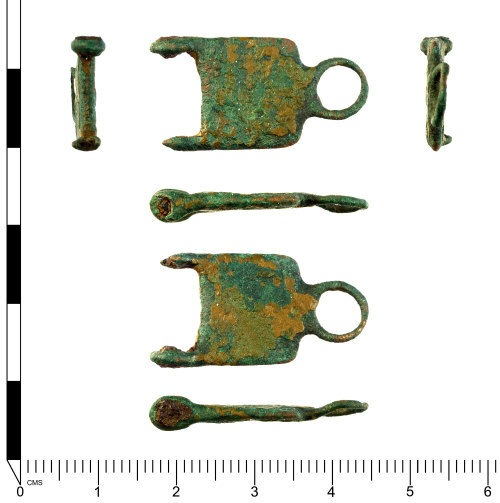 This bar could have been half of a hinged fitting, or could have been for suspension, as in a chatelaine. The metal is dark green and there are possible traces of a surface coating such as gilding on both faces. It is 28mm long, 15.1mm wide and 4.5mm thick. 3.47g. The object could function as a book fitting such as NMS-551569 or SF-743945, though a close parallel has not been found. Other possibilities include a hinged strap fitting or a sword belt fitting.